First, let me perfectly clear about a few things: There is no Outer Space; There are no planets; stars are not burning thermonuclear giants; There are no nebulas; comets and asteroids are not chucks of rock flying through the void of space. In fact all of modern astronomy is a farce. It’s all Science Fiction. You must be saying I’m totally daft. How can I possibly say or even think such absurd thoughts? You must also be asking why in the world would the venerated space agencies present space as a reality if it is, in fact, a fiction? What would possibly motivate them to sustain such a farce and how could they fool seemingly intelligent people in the reverent halls of modern academia. This is impossible you say. Another thing that needs to be clarified: Intelligence or the ability to recite information in a logical manner does not equate to the truth. If I can describe in minute detail the people, places and events that occur in the Lord of the Rings or Harry Potter, it does not mean they exist, have ever exited or will exist. I could take a course in “The Physics of Wands in Harry Potter”, read hundreds of esteemed books, write papers, submit thesis, get peer reviewed, and ultimately receive a doctorate, but this will tell me nothing about the real world regardless how much I believed it to be true. Knowledge is not knowing. If you are completely unwilling to examine the evidence presented and just accept the word of so-called experts, then I would suggest that you should be a possession of the managing powers of the world. By willing handing over your will, thoughts and feelings to an outside agency, you have demonstrated your inability to manage your own person and require intervention by such powers. Discernment is a requirement to understand the truth. In fact, you should not continue to read this post or any other piece of evidence if that is the case. You are not ready for the truth. If that is the case then you must believe what you are being told and continue in your blind ignorance. Stop reading now. However, if you are capable of examining ideas with an open and independent mind, then please continue reading. I would expect that any ideas put forward here are examined and properly verified using your own means. I’m simply putting forward ideas. I wanted to revisit the whole concept of weightlessness as it pertains to so-called “outer space”. Let’s examine the key points that define how weightlessness is supposed to arise when an object or person is in “space”. It all starts with a hypothesis by Newton himself (or at least attributed to him) that describes how a cannon ball fired with sufficient velocity in “outer space” would continue to move as per his 1st law of motion and would be kept indefinitely in orbit due to the gravitational pull of the earth and would subsequently “free fall” around the planet. If we can get past this untested hypothesis and allow for the suspension of disbelief, we can try to drill down into the misconceptions related to it. First we need to examine what the cannon ball is doing while revolving around the earth. If fired at a sufficient speed and unimpeded by any other object or force, the cannon ball will move tangentially to the surface of the earth while being “turned” around the globe. If we apply the same logic to the cannon ball, we can see that it should “turn” around the earth but not “fall” to the earth. So here is a major misconception: the cannon ball is “turning” around the earth not “falling” around the earth. In other words, there is no free fall of the cannon ball. Why is this important? Simply because floating “astronauts” are impossible if there is no free fall. The important word to focus on is “perpendicular”. Since the velocity of the orbiting object (i.e. cannon ball, space craft, etc) is perpendicular to the force of gravity and is hypothetically kept in orbit due to a sufficient velocity along with the centripetal force of gravity, no free fall is possible. Compare this to an object in free fall where the direction of velocity is in the direction of gravity or parallel to the force of gravity. For something to free fall it has to actually fall. When other explanations use elevators or thrust, they are assuming the objects in question are parallel to gravity or to the thrust of the rocket. To overcome the weight force, airplanes generate an opposing force called lift. Lift is generated by the motion of the airplane through the air and is an aerodynamic force. “Aero” stands for the air, and “dynamic” denotes motion. Lift is directed perpendicular to the flight direction. The magnitude of the lift depends on several factors including the shape, size, and velocity of the aircraft. As with weight, each part of the aircraft contributes to the aircraft lift force. Most of the lift is generated by the wings. Aircraft lift acts through a single point called the center of pressure. The center of pressure is defined just like the center of gravity, but using the pressure distribution around the body instead of the weight distribution. As the plane’s engines move the wings forward, the air has to flow both over and under them. The wings are designed so that net effect is that the air pushes them upward, countering the downward pull of gravity. So the upward forces of lift have cancelled out the downward pull of gravity. People don’t experience weightlessness while flying, so why would the astronauts? We are in a bit of a conundrum. The aeroplane has overcome gravity yet the passengers aren’t floating around like astronauts nor has the plane flew of into “space”. How is this possible? The mass of an average jetliner is about 351,534 kg while the mass of the ISS is about 419,600 kg. To calculate the centrifugal force you need to take the linear speed squared and divide by the radius. In both case, the radius is equal to radius of the earth + the cruising altitude. Since the airliner is going at a slower speed (~ 500 mph) it will require a constant thrust to stay aloft since the the buoyancy force of the atmosphere is constantly pushing the airplane downward (the buoyancy force operates in both directions depending on the object and the fluid it is contained in – but this will be discussed later in this post). Some will argue that the centrifugal and centripetal forces must balance out. I completely agree with that statement. Earth’s gravity is a constant force (I keep hearing). It can’t pull any harder than 9.8 m/s². It’s kind of like having a weak string attached to a sphere you are swinging around your head. If the string breaks, the sphere will fly off. But until that point the sphere is fixed in place (i.e. orbit). If you could place a marble inside the sphere and begin to swing the sphere around, what would happen to the marble? It all depends upon the orbital velocity. If the sphere orbits at the exact velocity to ensure the string doesn’t break but it also doesn’t allow it to go slack, the marble would not float in the middle of the sphere, it would push against the outer edge of the sphere. In fact, any amount of angular velocity would force the marble to the outside edge. In the same way, the astronauts should remain fixed to the ceiling (outer edge) of the ISS. (the mass of the Earth is 5.967´ 1024 kg). We can see that the centrifugal and centripetal forces are balanced but the effect would not be a free fall but cancelling of forces – just like a person who is flying in an airplane. Do we float around? No. Since there is no change in distance in the direction of gravity, then a = 0 and if that is the case then F = 0. The balancing of force does not mean weightlessness. During orbit, the astronauts should be standing on the ceiling of the ISS and have a weight that is 89% of their weight on the surface of the Earth (being forced to the outer edge by angular velocity). However, if the ISS could maintain its altitude without orbiting, then the astronauts would have to be standing on the floor of the ISS. THEY WHOULD NOT BE FLOATING. As I mentioned earlier, the concept of floating is incorrect since the proposed reason for floating is because they should be falling. Anyone who has been on a plane during bad turbulence will attest that during the sudden loss of altitude, objects will crash into the ceiling of the plane. This is not because they are weightless but because the ground beneath their feet has suddenly dropped away. The “vomit comet” plane shows people falling because the plane itself is falling (it is dropping parallel to the so-called force of gravity) not because the people have suddenly become weightless. In contrast to this, the ISS is not falling since it is NOT losing altitude. In fact, the only way for the astronauts to be floating (the way we are shown in countless videos) is if the ISS was in a constant free fall (which it is not nor could it be). For the ISS to maintain the altitude it does while maintaining it’s supposed path around the Earth, it must maintain a constant speed. Any variation from this would result in either the ISS crashing to Earth or flying off into “space”. Hypothetically, the ISS would need to be creating an artificial Lagrange Point. The Lagrange points mark positions where the combined gravitational pull of the two large masses provides precisely the centripetal force required to orbit at the same angular velocity (essentially, the speed of the orbit) and thus remain in the same relative position (or altitude). This artificial Lagrange Point is reverse engineered from a mathematical model that requires the ISS to orbit at an absurd velocity. The speed is required to make the math work as opposed to the math describing reality. Since the ISS is not in a free fall but rather orbiting at a constant altitude, the astronauts should experience the effects of angular velocity. Hypothetically, the force of gravity is always perpendicular to the floor of the ISS which means the centripetal force is always acting upon the astronauts in the opposite direction – meaning towards the ceiling of he ISS. In this hypothetical situation, the forces are balanced but what does this mean in reality versus a mathematical model? If we compare this to a car travelling with a constant velocity in a straight line along a road, no effects of that motion would be experienced by the driver. If, however, the driver turns a corner, the effects will be felt as a pull in the opposite direction of the turn. Assuming a constant turn rate and velocity, an object sitting on the dashboard will only begin to move once the forces of friction and inertia are overcome by the angular velocity forces – the object breaks free of the forces of friction and inertia and moves away from it’s static location or in the case of the ISS, it flies of into “Space”. In this example, the forces of friction and inertia are equivalent to “gravity” and the angular velocity is the motion of the ISS. Too much velocity and ISS will fly off into “Space”; too little and it will fall to the ground. But until then, the object stays put on the dashboard surface and the ISS stays in “orbit” even if the opposing forces are equal. In reality, the ISS would function much like a fast moving aeroplane. In the hypothetical environment of “Outer Space”, there is no atmosphere to slow it down but there also isn’t an atmosphere to create lift. So how does it stay aloft? From the artificial Lagrange point I wrote about earlier. If an aeroplane was able to travel at the same velocity and constant altitude (it doesn’t matter what altitude since we have artificially removed the atmosphere) as the ISS, it would not cause the passengers to become weightless. It would allow the plane to stay aloft without additional thrust just like the ISS is supposedly doing – Another artificial Lagrange point. The only difference would be a slight change in speed due to the increased “gravity” at a lower altitude. When the g-force acceleration is produced by the surface of one object being pushed by the surface of another object, the reaction force to this push produces an equal and opposite weight for every unit of an object’s mass. The types of forces involved are transmitted through objects by interior mechanical stresses. The g-force acceleration (except certain electromagnetic force influences) is the cause of an object’s acceleration in relation to free fall. Gravitation acting alone does not produce a g-force, even though g-forces are expressed in multiples of the acceleration of a standard gravity. Thus, the standard gravitational acceleration at the Earth’s surface produces g-force only indirectly, as a result of resistance to it by mechanical forces. These mechanical forces actually produce the g-force acceleration on a mass. For example, the 1 g force on an object sitting on the Earth’s surface is caused by mechanical force exerted in the upward direction by the ground, keeping the object from going into free fall. The upward contact force from the ground ensures that an object at rest on the Earth’s surface is accelerating relative to the free-fall condition. (Free fall is the path that the object would follow when falling freely toward the Earth’s center). Stress inside the object is ensured from the fact that the ground contact forces are transmitted only from the point of contact with the ground. How can an object at rest still be accelerating? This paragraph is full of contradictory concepts. For the ground to be pushing up, there must be a continuous force pulling down. You can’t be accelerating if you are at rest. And this has NOTHING to do with the supposed spin of the earth. Some would argue that if they throw an object up in the air, the point where the object comes at rest in mid-air (i.e. maximum height before falling back down), the acceleration due to gravity is acting upon the object even though it is at rest. This example is making liberal use of the word “rest”. If an object was thrown with a slight arc (even a tiny one), the object would never be “at rest” since the object would follow an arc pattern and be in continuous motion. That the arc of an object throw directly upward is zero is simply a mathematical description of one possible scenario where the object transitions from upward to downward in a single moment. For any rational person, an object thrown into the air is always in motion until it is actually at rest on the surface of the earth. To say it is “at rest” while in motion is sophistry exemplified. There is an order of magnitude more volume at the periphery than the center. In other words, the center would be pulled towards the periphery due to the greater mass. This would make planetary formation through gravitational attraction impossible. For as more mass accumulated on the periphery, the less attractive the force in the center. The amount of air above a persons head pushes down with a force of approximately 7 pounds / square inch. The average human head is about 21 inches in diameter or π x r2 = 3.14 x 10.52 = 346 square inches. At 7 pounds per inch, there should be 2,424 lbs / square inch of additional weight on the head of each human being. If I stand on a scale and weigh 72kg and then pick up 2 weights of 10kg each, the scale would show an increase of 20 kg to 92kg. For the same reasons the weight of every human being on earth should be their weight + the weight of the atmosphere above their head. This is what the theory of gravity must predict to be true. However, no one experiences an additional 2,424 lbs of weight on their head. This is another falsification of gravity. We also need to differentiate between air pressure and air mass (or weight). Pressure is caused by air being forced into an enclosed space which causes more air molecules of air to be present in the same space. Air weight is the downward force caused by gravity. What causes air pressure to be perpendicular to the force of gravity? According to the theory of gravity, once an object is in contact with the surface (in this case the human head) it will experience resistance from the skull which pushes back with an equal amount of force thereby stopping the downward motion. The earth is not a pressurized container since the only thing holding the atmosphere in is gravity and gravity is in one direction only – downward. Therefore, there is no known force perpendicular to the force of gravity which can explain air pressure. Since air cannot be lighter or denser than itself, density and buoyancy cannot be be used to explain this problem away. That the net force between an object a rest on the surface of the earth is zero, does not mean there is no force between them. It’s mathematical slight of hand to make it seem like no force is present. If that was the case then all objects would weigh zero. The key word is NET. As I wrote earlier, if I pickup an additional 20kg of weight the NET force between myself and the ground is still zero even though the scale has registered an increase in weight. If I place my hand on the ground and place 2000kg on it, my hand would be crushed even though the NET force is equal to zero. Another way to think about this is to examine how a balancing scale works. If I place a 1kg weight on both scales the forces are balanced – or equal to zero. However, there is a force of 1kg still pushing down on each scale. That they are balanced does not negate the forces in question here which is implied with the word ZERO. We can test this by removing one of the weights. The scale will become imbalanced and tip in the direction of the remaining weight. Many of the globe folks comment that if buoyancy is responsible for the downward force on objects, what is it that makes them “fall” downward rather than “upward”. The answer is that objects do “fall” upward – Helium balloons for example. Objects of different densities separate at a constant rate plus or minus the addition of external forces. What we experience as “down” is really the separation of lighter material from more dense material. Objects go in opposite directions which creates “up” and “down”. So why is “up” above our heads and “down” everything below our feet? Because of the density of the average human is greater then air. We, as physical humans, will tend towards objects of equal density – the ground beneath our feet vs. atmosphere above our heads. If we became lighter then the density of the atmosphere, “down” would become what we experience as “up”. Just as “down” for a helium balloon is “up” for humans. Similarly, if a beach ball filled with air is forced under water to any depth, it will rise at a specific rate. But it is “falling” “down” towards a location of equal density or equilibrium. Just as it takes energy to submerge the beach ball, it also takes energy to place a human above the surface of the ground. The atmosphere is constantly pushing the human towards the ground and simultaneously pushes a helium balloon towards the sky. The title of this blog might seem, at first, to be debunking the flat earth; it is however, a vital hypothesis towards a proper theory of the earth’s shape. My previous posts have presented various concepts that try to show many inconsistencies with the heliocentric model. The problem with such an effort is that a proper model for the flat earth that fits the empirical data is never properly developed. My goal is to present a model that does, indeed, do this. What do I mean by the ‘Sun never sets’? Well, in the heliocentric model the sun is literally “setting” or disappearing below the horizon. Due to the hypothesized ball shape of the earth and its associated spin, the sun will eventually become obscured by the curved surface of the ball (i.e. you can’t see through solid ground). In the flat earth, the sun is always at the same height (with some minor changes as will be explained later), regardless of the date or time, at all locations on the plane; hence, it never sets. So how does the sun function on a flat plane to create seasons, timezones, night, day, etc? Many current models have been presented and many of these questions have been answered to varying degrees of satisfaction. 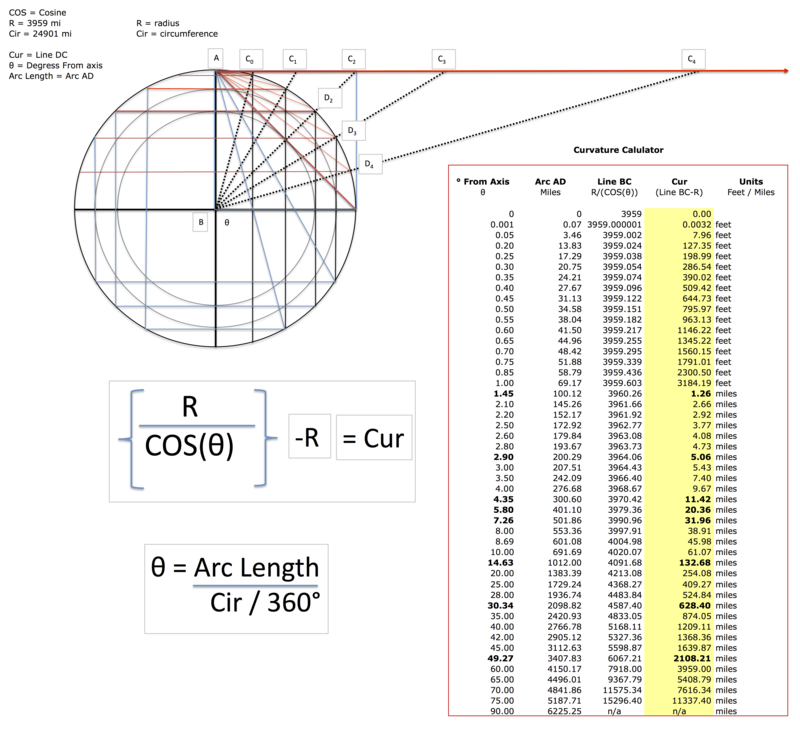 The most confounding problem that faces the flat earth model is the trigonometric disconnect between the latitudes, angle of incidence and height of the sun – the sun is just not where it’s supposed to be! This problem provides heliocentric proponents with the most devastating argument against the flat earth because even with a obviously lack of curvature, the trigonometry matches the ball model better than the flat model. So we are in a kind of stalemate – neither model can claim victory. However, I have developed a hypothesis for the sun that not only fits the flat earth model but also a methodology for mapping the earth we live on. I wanted to add a video by Jeranism which perfectly visualizes what I’m trying to present. Please watch this video before reading the rest of this post since it will help you understand how such a phenomenon is possible. At a distance of 6225 miles from the observer, due to laws of perspective and refraction, the sun will appear to be at the horizon (~ 1°). At a distance greater than 6225 miles the sun will begin to “set” or “rise” as it approaches. Since the sun is at the same height (with specific increases and decreases with respect to seasons), regardless of the position of the observer, we must apply the laws of perspective to obtain an accurate altitude of the sun. The sun is between 4200 – 4600 miles above the plane depending on the date. It is this fluctuation that produces the analemma. I’m certain that many will object to this model by arguing that objects at a shorter distance do not present this kind of affect. In other words, an object that is 100 feet away at 10 feet in height will not display the effect of perspective. That the effect is so infinitesimal does not mean it’s not present. For example, an observer 67.15 miles from an object 2 miles in height would only measure an effect of perspective of 1.6 feet – That’s a 1.6 foot difference over 10,560 feet. In other words, if it’s almost imperceptible at 67.15 miles, it’s definitely imperceptible at 100 feet. So what am I basing this scale on? Well…the sun, moon and stars. They are the only objects that are at a sufficient distance and height to show the effect. Ultimately, the position, height and motion of the celestial objects in the sky are either due to perspective or curvature. Since no curvature has been show to exist (at least empirically), then we are left with perspective. This video by Wide Wake perfectly shows how the sun becomes distorted as it moves away from the observer (it becomes egg shaped). The video by Jeranism shows the mechanism by which this affect occurs and why it appears to drop. I’ve uploaded the Excel workbook for anyone to use. 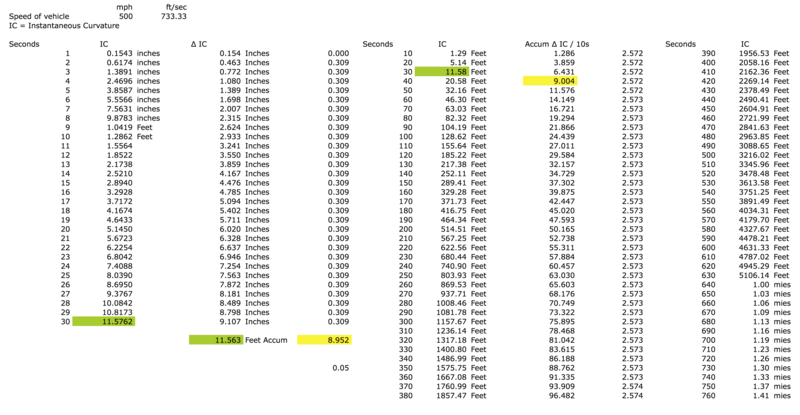 I was able to use both Date & Time and Stellarium values for the Sun’s height at various location on the earth. The values match almost perfectly with the hypothesis. There are 4 tabs in the workbook as I had to calculate the equinox and both solstices. I added a short-distance tab to calculate objects closer than 1°. The result is that the effect of perspective is accumulative with both distance AND height. In other words, as the object increases in height and distance, the effect is more pronounced. In the example above, a mountain that is 67.15 miles away and at a height of 2 miles will have an insignificant amount of this affect since the accumulated affect is limited to relatively small values. With an accurate way to measure the distance and heights of the celestial objects, we should be able to map the surface of the earth using the formula above. My previous post “How ascending planes debunk the globe – part 2” describes, using simple trigonometry, how the ascent rate of an airplane is impossible on a globe. The rebuttal to this was that the airplane somehow still “follows the curve” while ascending. However, an airplane cannot simultaneously “follow the curve” which requires the trim to be constantly in the upward position (Nose-Down), while at the same time ascending which, requires the trim to be in the completely opposite position (Nose-Up). Therefore, during take-off and descent, the total amount of curvature that SHOULD be accounted for by the trim is non-existent. Just take some time and think about that. The use of trim tabs significantly reduces pilots’ workload during continuous maneuvers (e.g. sustained climb to altitude after takeoff or descent prior to landing), allowing them to focus their attention on other tasks such as traffic avoidance or communication with air traffic control. Both elevator trim and pitch trim affect the small trimming part of the elevator on jet airliners. The former is supposed to be set in a certain position for a longer time, while the pitch trim (controlled with the landing pilot’s thumb on the yoke or joystick, and is thereby easy to maneuver) is used all the time after the flying pilot has disabled the autopilot, especially after each time the flaps are lowered or at every change in the airspeed, at the descent, approach and final. Elevator trim is most used for controlling the attitude at cruising by the autopilot. As you can see, once the elevator trim is set, it is rarely adjusted by either the autopilot or the pilot. Even if we allow for the trim to be constantly adjusted, it is not designed to nor does it ever “constantly adjust for curvature”. However, if we assume that curvature does exist, to satisfy those who insist on curvature, then the trim would have to account for it. You can’t have one without the other folks. This is because a curve is a non-linear shape that requires a constant change in pitch to maintain a constant altitude and thereby “follow the curve”. For each change in pitch, the trim must add each subsequent change to maintain the non-linear shape. I’ve used the curvature math above but also included the speed of the aircraft to calculate “Instantaneous curvature” – or how much curvature must be accounted for over a certain period of time and velocity. Assuming an aircraft with a velocity of 500 mph, the amount of curvature increases by 0.309 inches / second. This might seem like an inconsequential value at first however, this is an accumulative value that increases over time. For example, after the first 30 seconds, the amount of curvature that the trim would need to adjust for is 10 feet. After 760 seconds (12 minutes), the trim needs to adjust for 1.41 miles of curvature. If the trim is constantly adjusting for curvature, then no drastic motions would be felt by passengers and crew. However, this would cause the trim to be in an impossible state after just a few minutes of flight. But this is somewhat of an academic exercise since neither pilots nor the autopilot adjust the trim in this fashion. You said that, if the plane was trimmed for a straight and level flight, it would ‘gain altitude’ while flying as the earth surface ‘fell away’ due to the curvature of the earth. Well, that would probably happen in a perfectly motionless atmosphere where the plane would fly dead ahead, and over time gain altitude (provided it has sufficient thrust) as the earth curves away from under the airplane. In reality, a constant altitude must be kept using the standard pressure and that means a fixed distance to the earth center of gravity is maintained, making the path of the plane a curved one. As such, the flight controls are constantly moving very subtly to maintain the correct attitude. I would agree but he’s not applying a spherical model to the response, only a flat surface model. If he was flying over a sphere, the trim would have to adjust every second. How should an aircraft maintain altitude on a sphere? For every 69.1 miles of flight, a 1° change in pitch must take place. If the pilot makes only a single 1° change in pitch over a 500 mile trip (a total of 7.2° of pitch change) then the airplane will be 6.2° off of level. A single 1° pitch change from a particular starting position produces a slope not a curve. To maintain a curve, the pitch change MUST increase with time. So to travel 6,219 miles on a sphere, the trim of the aircraft would have to account for 90° from the starting position. This is regardless of gyroscopes or accelerometers. Unless the aircraft “follows the curve”, it will increase in altitude and to “follow the curve”, the trim MUST be in a constantly increasing, upward position. No pilot would ever adjust the trim to such a degree since it would cause a major imbalance in the aircraft. In other words, this could not happen nor does it happen because we don’t live on a sphere, rather, it is indicative of a flat surface. if a pilot or autopilot had to change pitch to maintain “level” flight (by pushing forward on the column or modifying the trim) the pilot or autopilot could not nor would not pull back on the column nor put the trim back to the original position once the adjustment was made otherwise, they would continue to fly in a tangent to the surface of the sphere and subsequently start gaining altitude again. Again, any pilot would tell you, the trim is not continuously adjusted for curvature nor are they continuously pushing forward on the column. The point being that once trim is set to a particular level (especially the elevator trim), it is left alone. This totally contradicts what should happen on a sphere but is complete what we would expect on a flat surface. Now some of the globe folks (including pilots) will evoke gravity to fix this rather intractable problem. However, to evoke gravity at this point and say that, “IT keeps the plane level”, is to ignore the obvious: the aircraft has already overcome the supposed effects of gravity otherwise it could not be in flight – Even NASA agrees. Weight is a force caused by the supposed acceleration due to gravity and the lift forces have already overcome the weight of the aircraft and thereby, gravity. Level flight is, either by line-of-site (i.e. pilot flying level to horizon) or via the gyro, not due to gravity. However (and for the sake of argument), if gravity was responsible for level flight on a sphere, by constantly forcing the aircraft level (or tangent to the sphere), then the ability of the aircraft to ascend or descend would be impossible since it could never increase it’s angle of attack from level. This, of course, does not happen in reality. The problem of arguing whether the earth is spherical or flat using everyday experiences (i.e. flight) is that IF the earth is FLAT, those who do subscribe to a spherical earth will be using experiences of a FLAT earth to try and describe a spherical one. In other words, they use actual events and then describe those events through the lens of a spherical model (i.e. since the earth is a sphere, and planes fly level, it’s due to gravity). Instead, they should be describing events AS THEY SHOULD HAPPEN on a sphere not on a FLAT plane. The model should be predictive not reactive. In other words, does the spherical model describe our experiences? For example, the gyroscope is known for its ability to maintain rigidity in space and provides empirical evidence for a flat surface rather than a sphere. However, the subscribers to the spherical model say that the gyroscope is modified during flight to account for the change in pitch. There are several problems with this. 1) The aircraft MUST “follow the curve” regardless of what the instruments say or bad things will happen. 2) To “follow the curve” a real change in pitch MUST happen. It cannot be ignored by modifying the gyro. 3) Even if they gyro was modified to continually adjust for pitch changes, it does not alter the fact that the trim MUST be continually changing position to adjust for real pitch changes. 4) A small aircraft, like a Cessna, does not modify or have the ability to modify their gyros during flight (i.e. Schuler Tuning) which debunks the notion that this happens with larger, commercial aircraft. But even if we allow for that, it doesn’t fix the problems with the spherical model as has been explained. In my last post about how an ascending plane debunks the globe, I wrote that the GE folks will use the argument that the plane is tracking with the curve therefore, curvature is of no consequence. Even though I have the mathematical proof of this impossibility, I was challenged anyway. It seems the only way to provide definitive proof, is to show that the rate of climb, the climb angle and the speed of the aircraft make it impossible for it to track with the curvature. As the aircraft ascends, it does so at a specific angle and speed. Knowing these values, we can map the actual path of the aircraft as it ascends. For the aircraft to track with curvature, it would need a much smaller climb angle since the curvature alone provides 4.37 miles of altitude. It must also be noted that commercial aircraft like 747s gain altitude by aiming the nose upward and gaining lift through forward motion; they do not act like balloons and float upward. When the aircraft starts to take-off it angles the nose upward and ascends away from the ground. In order for the aircraft to track with the curvature it would have to stay perpendicular to the axis of the earth. As the distance from the starting point increases, the smaller the climb angle would need to be. The final altitude is 6.62 miles which leaves 2.25 miles that the aircraft would need to climb. To calculate the necessary angle we would take the inverse TAN of 2.25 miles / 185.97 miles. This means that the average angle over the entire ascent would have to be 0.69°. Unfortunately for GE folks, this is not what happens in the real world. During take off most 747 aircraft use a climb rate of about 12° but reduce that by about 0.5° every minute or so. There is obviously variability based upon certain conditions but this is sufficient for this case. By recording the level on a flight to France I can confirm this reality with going into speculative territory. I can say for certain that the pitch of the aircraft for the first 12 minutes was between 4-12° and the final 13 minutes ranged between 1-3° making an average of 0.69° impossible. At the end of the day for an aircraft to ascend on a curved surface while tracking with that curve, it must be perpendicular to the axis of the earth and ascend like a balloon. I have watched and read FlatEarth (“FE”) content that talks about the issue with flight paths, times and other anomalies that are difficult or impossible on a GlobeEarth (“GE”). However, many GE folks tend to write-off these anomalies by evoking gravity. Though the gravity excuse can be rebuked, it gives the GE folks a free pass. This pass is about to be taken away. My previous work on curvature calculations has given me the idea to track the flight path of a 747-200 class aircraft during the ascent phase of the journey. On a recent trip to France I recorded the angle of ascent using a bubble level and screen capture software. 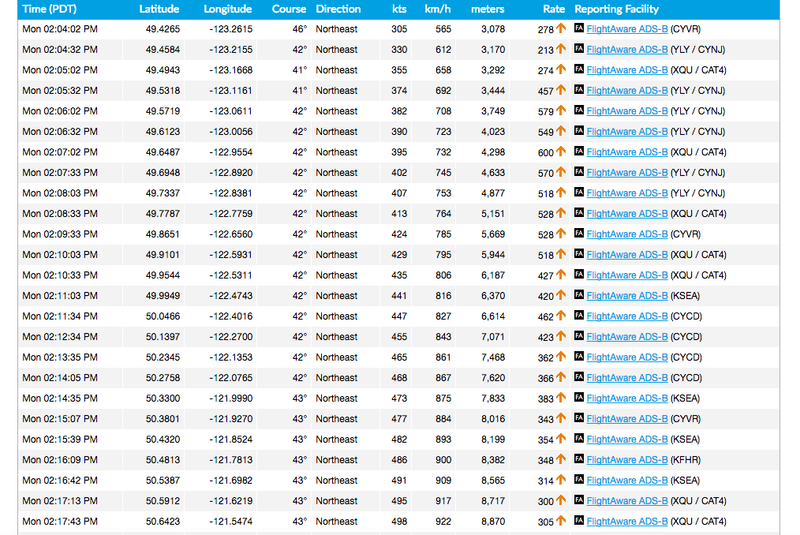 This allowed me to compare (in real-time) the ascent angle over time with the flight data from Flight Aware. The majority of the ascent was between 1-3°. It lost about 1° of angle every minute. During the initial take off the angle was much higher at around 12° but it quickly reduced to 2° in about 12 minutes. The final 13 minutes was at a nominal angle of 1°. A quick calculation shows that TAN(2°) x 185 miles (6.46 miles) is close to the 6.62 miles achieved after 25 minutes. In other words, the bubble level and the recorded values from flight aware seem to correlate. 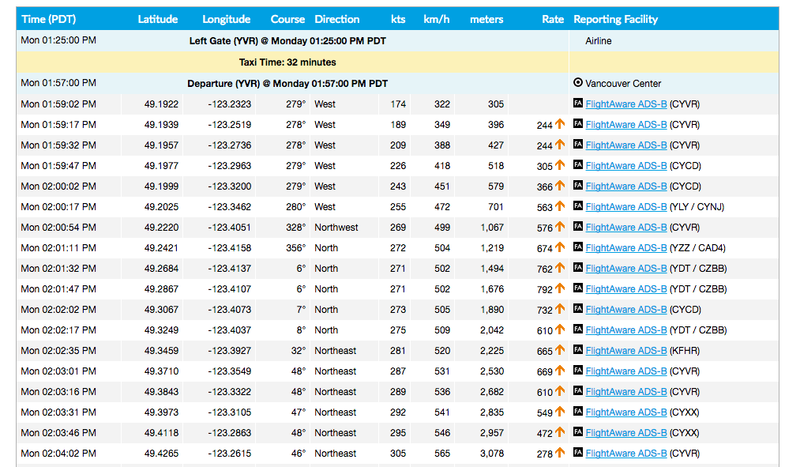 If you have an account at flight aware, you can take a look at the actual flight taken. I will add the data tables here for those who don’t wish to create an account. The purpose of this post is to show that if there is curvature to the earth, the climb rate over time and the curvature of the earth must place any average international flight at more than double the recorded cruising altitude. This is because the amount of curvature during the ascent phase of the example flight below would be approximately 4.37 miles even without adding any climb at all. 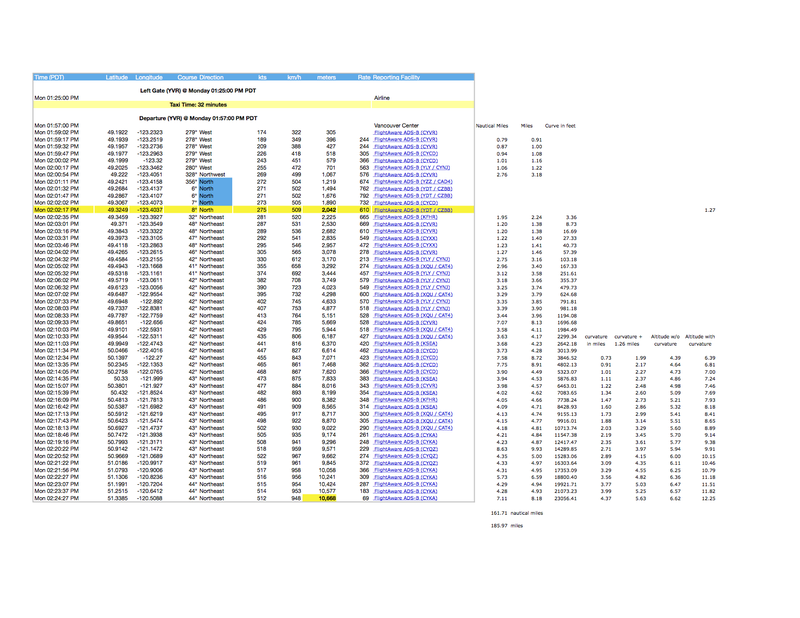 All of the data is publicly available and anyone can do the same calculations I’m going to do. In fact, any international flight can be used for this experiment. An examination of this data eliminates a potential objection by GE folks that plane is flying with the curvature of the earth since the plane cannot be tracking with the curvature and ascending at the same time. By it’s very definition, the plane is moving away from the ground (ascending), not tracking with it as it should during cruising altitude. This might seem obvious to most logically minded folks but we are dealing with hardened attitudes that will use any argument, no matter how illogical, to avoid the conclusions reached here. Since the plane is ascending, and if we are living on a ball, we must take into account the ascending and curvature rates at the same time. There is no getting away from this. This also destroys the idea that gravity keeps the plane moving along the curve, since if this was the case, a plane could never ascend at all. The ascent angle over time is the key. For example, if a plane took off and ascended at a nominal climbing rate of 1 meter / hour at an average speed of 450 miles / hour, it would reach a cruising altitude of 4.7 miles in 26 minutes. If it continued at this rate for 52 minutes (or an additional 26 minutes), it would be at a cruising altitude of 19.8 miles. The plane can ascend because it’s under it’s own power. It has already overcome the force of gravity or it would fall to the ground. But I digress…. Using a real example, if we include curvature into the calculation with the recorded climb rate, the plane should reach a cruising altitude of 35,000 feet (or 6.62 miles) in approximately 13 minutes. This was calculated using 51 specific data points. Each point contains time, latitude, longitude, course, direction, kts (knots), km/h, meters, climb rate and reporting facility. By calculating the speed by the time interval, I can calculate the total distance travelled during each time interval. The first 12 data points are ignored for distance travelled since the plane took off in a westerly direction and then turned around to a northeast direction. We still need to include the altitude reach during this time frame which is approximately 1.26 miles. This altitude was reached at 2:02:17 pm. To accurately calculate the distance travelled, I had to measure the time difference between each data point (between 15-60 seconds) and multiply by the speed of the plane at that interval. This eliminated the use of an average speed which would most likely be used as an additional rebuttal against this proposal. If you examine the table below, you can see each time interval along with the height and curvature reached. The 7 columns of the far right show the curvature that would occur over the distance travelled. The distance travelled was calculated by converting the speed to nautical miles/min (i.e 281 kts / 60 min = 4.68 nm/min). Once I had that value, I was able to multiply that by the plane’s current speed to get the distance travelled (i.e. 4.68 nm/min × .41 min = 1.95 nm). I then converted the value from nautical miles to miles (i.e. 1.95 nm × 1.15 = 2.24 miles). Once I had the distance at each interval I could calculate the amount of curvature in feet. Whew !!! Since curvature is accumulative, the total arc distance from the starting point to the specific time frame must be included not just the distance travelled in that particular time frame. I finally converted the last 21 data points into miles of curvature. Since the plane was already 1.26 miles in altitude when it started heading northeast, I had to add that value to the curvature accumulated from 02:02:17 pm onward. I calculated both the altitude of the plane without curvature and one with curvature. As you can see from the table, the cruising altitude should have been reached at approximately the 13 minute mark. Since the plane does not stop ascending at the 13 minute mark but continues for an additional 12 minutes, we are left with the inescapable conclusion that there is no curvature. I’ve included a link to a post that calculates the distance covered during take off and the time taken to reach cruising altitude for comparison purposes. Hooke’s Law and the Missing Energy of Gravity. Mass x acceleration x time¹ = Impulse of Force¹ (¹ is all reference frames from 1 – 10 seconds). Multiplying Force · Time is known as impulse and is a valid way of expressing a force. However, where I caught the consternation of others in the twitter realm was due to confounding of terms that are very specific in the physics world. We all experience the affects of forces all day, everyday in our lives and we generally don’t break them down into units of measurement, types of units, work vs. force, etc. So my way of describing what I see as a fatal flaw in gravity was met with irate rantings. For one, I was pointing out a potential problem with something they hold in an almost sacred sense (gravity). And secondly, I was not using terminology correctly for their taste. I don’t necessarily blame them for wanting exact language, but I would argue that they most likely understood the point I was trying to make but did not want point me in the right direction. But, for the most part however, they were decent. In a way, by them resisting what I was presenting forced me to fix and clarify my position. What I saw was that over time the acceleration due to gravity should equate to an increase in force on the mass involved. However, the concept of force is important since in the case of gravity it is, indeed, constant. I wasn’t arguing that gravity is increasing but the net forces are increasing. I kept arguing that time must be included in the equation or it doesn’t represent reality (though it was valid see impulse of the force). But again, my use of the words net force with time was incorrect with respect to physics as we are taught today and net forces has a specific meaning. It wasn’t until I recalled kinetic and potential energy (work) and how it relates back to force that I was able to present my case in a language that would be acceptable. From the car example above, if F = ma, then the rate of change is 40,000 N which means the force is constant. But this is counter-intuitive to most people since they know the car is traveling faster with each second. However, for acceleration to exist at all, energy must be constantly applied. If we accept the conservation of energy law, then that energy must be going somewhere. In this case it is being expressed as kinetic energy. In the case of gravity acting on an object or a person on the earth’s surface, gravity is that constant force or energy that is supplying the acceleration. Either the object or person needs to move or the energy needs to be converted into something else like heat or sound or whatever. It is the amount of energy that is increasing not the force itself. We can conclude then, that time multiplies how much energy is in a system with respect to the force being applied. We can all bear witness to the fact that we are not heating up or emitting noise or expressing some other form of energy release under the stress if gravity. The counter argument is that since there is no movement there can be no acceleration. But this is a fallacy since the height of the person is equal to the “x” value in Hooke’s law and the motion is expressed as the compression of the human frame. There is also a distinction between kinetic energy and potential energy. A car driving at 100 km/h has a specific amount of kinetic energy but a spring under increasing compression has potential energy that is being stored in the spring itself. The spring has a maximum compression it can reach before it will begin to become crushed under an increasing load. Hooke’s law is only a first-order linear approximation to the real response of springs and other elastic bodies to applied forces. It must eventually fail once the forces exceed some limit, since no material can be compressed beyond a certain minimum size, or stretched beyond a maximum size, without some permanent deformation or change of state. Many materials will noticeably deviate from Hooke’s law well before those elastic limits are reached. Even though the spring no longer has motion the amount energy will increase as the load capacity is transferred to less elastic structures like the metal of the spring or the surface the spring is sitting on. In other words, the increase of potential energy will propagate to the surrounding environment and begin to compress the weakest structures first. In the case of a human being standing on the surface of the earth, the acceleration due to gravity would continue to propagate through the human frame as per Hooke’s law. I have had many discussions with folks who insist that the forces between the earth and the human being cancel each other out. But they are confusing force with work. Any equal and opposite reaction is within the frame of the human being (like a spring) and the ground they are standing on. The opposing forces balance out, but this would not stop the acceleration; the balanced forces would only resist the downward pull of gravity and subsequently increase the potential energy. Since gravity is supposed to be an acceleration and is supposed to be pulling at a force proportional to the mass of the earth, the human being wouldn’t stand a chance. It is precisely because of the equal and opposite reaction and the balancing of forces that potential energy is possible. So they are confusing the forces involved with the energy (work) being applied to the mass. assuming conservation of energy: if F=ma and a = 9.8 m/s² and m > 0 then ΔPE > 0. where’s all that energy going? We should all be crushed by now. which comes from adding up the energy it takes to incrementally compress the spring. That is, the integral of force over displacement. Since the external force has the same general direction as the displacement, the potential energy of a spring is always non-negative. Note that the change in the change in U is constant even when the displacement and acceleration are zero. What does this mean? It means, a constant and catastrophic amount of potential energy should be building up in every object on the earth’s surface. As mentioned above, this does not violate F=ma since we are not talking about an increase in the force of gravity but an increase in potential energy due to that constant force. If we calculate the “elastic” capacity of the human frame and equate it to “k” and multiplied that by “x” which would be the height of the person (since they should be getting compressed by gravity) and then multiply by 1/2 we should get the potential energy stored or expressed within the human frame. Also, since the value for “k” of the human being is less than “k” for ground, the human being would be crushed into the ground. However, as we all know, we aren’t springs, and won’t bounce back from such an event. Most of the energy will be released in the form of noise and heat. Not a pretty picture. The modern theory of elasticity generalizes Hooke’s law to say that the strain (deformation) of an elastic object or material is proportional to the stress applied to it. However, since general stresses and strains may have multiple independent components, the “proportionality factor” may no longer be just a single real number, but rather a linear map (a tensor) that can be represented by a matrix of real numbers. So we can all say with a high level of certainty that we are not being crushed by gravity, therefore, gravity must be falsified. We exist in a non-gravitational realm. Note: Just as my previous post, I had to fix some errors in my formulas. However, the conclusions are the same. As a follow up to my previous post, I wanted to take a closer look at the gravitational constant of “Big G”. Upon examination, I found that though Newton used Kepler’s laws of planetary motion, the relationship between them is rather ambiguous. For example, Kepler’s laws deal with the velocity of a planet around the sun with respect to time – meaning: The time it takes to complete an orbit and the area covered is proportional. There is no force involved since he was not concerned with the mass of the objects. The time it takes for a planet to revolve around the sun increases with distance, hence his proportional law of 1/r². But, again, this has nothing to do with a force acting on the object, rather just the proportions of the ellipse and the time taken to traverse it. Newton, however, was completely concerned about the mass of an object. He took the proportions with respect to time and converted it into a force: Gravity. By replacing the proportions with mass he removed time from the equation. It is a constant that is applied over time as an acceleration but time is not factored in. An acceleration over time, by it’s very definition, is an increase in velocity over time. You can’t have a change in velocity without a change in time. The classic force equation F=ma violates this requirement since it excludes the time attribute. Math is a descriptor language so it must describe reality not abstractions. For example, a 4,000kg car accelerating at 10 m/s² for 10 seconds cannot be described by the equations F=ma since it excludes the change in time while it was accelerating. All it can describe is an abstracted force not a rational one. This translates into a significant problem for gravity since the velocity or force involved must increase with respect to time. Neither the mass nor the acceleration due to gravity changes, just the velocity and the time the acceleration is applied. A secondary issue is that the acceleration will increase as the distance between them decreases. In the case of gravity, the acceleration never stops since it is supposedly inherent to matter. No object could ever separate from any other object of any mass if time is applied. We neither observer nor experience what should be happening which is a self-evident falsification of the universal law of gravity. Simply stated: Gravity is Dead. Two bodies that are interacting require “something” to push against. For example, in a classic tug-o-war there are two teams pulling against each other using a rope. However, for it to work, they must push against the ground not air or space in order to pull. The classic F=ma equation usually cited does not give the fulcrum from which each body is pushing against. They can’t push against air or space while pulling at the rope. Hence, there is no “equal and opposite” reaction since there is nothing to react against. There is no push to the pull. Centripetal force is not gravity. This is a common misconception. Gravity is an independent force due to the mass of the object. People usually link things together which are not related. For example, angular momentum gives rise to the centripetal and centrifugal forces. The centripetal force is “pulling” at the the centrifugal force and the centrifugal force is “pulling” against the centripetal force and gravity at a rate of ω²r, where ω is the angular speed (=linear speed/r) but it does not cause gravity. In other words, they have to subtract the emergent centripetal and centrifugal forces from the force of gravity to get the resultant force. For example, a 72kg person will exert 2.36N of centrifugal force at the equator while gravity exerts (pulls) 705N of force giving a resultant force of 702.64N. But for gravity to pull it must push against something at that’s what’s missing. The earth must be fixed in space to pull. The only thing that gravity can push against is space and space must have zero mass. For space would need sufficient mass to resist the motion of any and all celestial bodies (galaxies, suns, planets, etc). Therefore, space would no longer be space but mass. So the conundrum for an astrophysicist is the necessity of space and the simultaneous necessity for space to have mass. They are mutually exclusive. For this reason, gravity violates Newton’s 3rd law. Since gravity is a function of mass, any supposed curvature of space is the result of the mass of the object not the other way around. Also, curvature of space around an object is impossible. This would require the supposed “fabric” of space is pulled inward towards the object. What exactly is it pulling on? Space by it’s very definition is empty. How can a force pull on emptiness? Even if gravity was granted such magical powers, it would then, by necessity, require space to have mass and if it has mass then it is not space. As well, time is an abstraction and a force can’t pull on an abstraction. Even if we grant gravity the magical powers to pull on emptiness it still needs to push against something to pull on something. We get into a circular argument where the space around the earth is being pulled on while simultaneously it is resisting the motion of the earth itself. Hence the allusion to Baron Munchausen pulling himself up by his own pigtails. The Inertial mass required to fix the earth in space would negate space itself. So regardless of which theory of gravity is evoked, it violates Newton’s 3rd law. Density and buoyancy are a function of the differences between the mass of objects. For example, an object more dense than air will drop to the ground due to the displacement of the surrounding air. Air under compression can push against a heavier object since the air is not being displaced. The mass of an object is also distinct from the force of gravity. Here we get to the crux of the problem? If a 72kg person is standing on the earth’s surface, they should experience a constant acceleration of 9.8 m/s/s. But this acceleration does not stop just because they are standing on the earth’s surface. Their “weight” will only be 72kg (702.64N) for one second. What happens at the 2nd second? Their “weight” would double since in the 1st second it is 702.64N + 702.64N in the 2nd second (the “weight” of a person in free fall is zero). In other words, we should all be compressed piles of mush. All mass should be pulled relentlessly into the centre of the earth. Therefore, since the acceleration due to gravity is not what we observe, it must be shown as having been falsified. Other celestial observations, like the gravity bending light, are non-sensical since the bending of light would require either space (which is empty and massless) or light to have mass. Neither of these have mass. The motions of celestial bodies (planets, suns, comet, galaxies, etc) are equally non-sensical since they require gravity and since gravity has been shown to be falsified, the motions of the lights in the sky are due to other phenomenon. And finally, outer space, planets, comets, etc are all constructs of the theory of gravity. Without gravity they fall apart. Welcome to the flat earth. Refractivity seems to be the last refuge of the GE theory. Since objects at a distance that should be well below the horizon can be brought into focus using a zoom leans on a camera, there is little an advocate of the GE can do other than claim it is all due to refraction. change in direction of propagation of any wave as a result of its traveling at different speeds at different points along the wave front. measurement of the focusing characteristics of an eye or eyes. The density of air at sea level is very similar regardless of temperature. It would require extreme heat or cold to vary the density to an significant degree. Here is a chart that shows the changes in refractivity with respect to range and height of the target (radar). Here is the original document for those interested. Pressure and water-vapor content decrease rapidly with altitude, while temperature decreases slowly, refractivity and decreases with altitude. Thus, velocity increases with altitude, and rays bend downward. Dominant change in refractivity occurs with along vertical. Key point: not the actual refractivity, but changes (gradient) in refractivity cause rays to bend. As anyone can see from the above graph, refraction has little impact at both lower heights and the greater the range (which will become important later). Most curvature experiments performed use an object at a distance that is brought back into focus using an optical zoom. Even if we calculate for curvature error due to refraction (typically 14%), we are left with 86% of the object that is visible without refraction. How can we account for that? In other words, refraction cannot be used by GE theory to account for objects being visible at a distance that should be below the horizon. So when surveyors are correcting for error, what exactly are they correcting for if they are not on a ball? The predictive model that I created for Polaris could possibly hold the answer. Instead of curvature that is being corrected for, the surveyors are actually correcting for perspective on a flat plane. I would bet that the error corrections in both radar and other visible light spectrums will be satisfied by the predictive model that was mentioned above. For example, an object at a great height (say 100,000 feet) but at a close range (<1 mile & > 45°) will become obscured at the “top” due to perspective whereas the same object will become obscured at the “bottom” as the range increases and the viewing angle is < 45°.